Typically Spring is full of winds and rain so we wanted to keep you posted in March of Safety and how to protect your home or business. 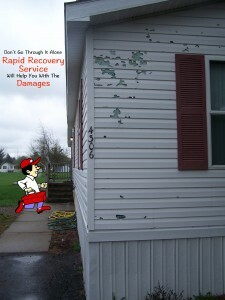 Extreme winds can cause several kinds of damage to a building, threatening you and your family’s or coworkers safety. During high winds, wind speeds fluctuate and may change directions, placing pressure on all parts of a building structure. These wind pressures may cause building components to fail. When wind speeds are high, pieces of debris can also become “airborne missiles’ that may penetrate the structure and possibly injure your family. By maintaining a “sealed envelope’, keeping the outside air from getting into your home, you may be able to minimizes damage to your home and reduce the potential for injury. Some extreme winds can turn into a hurricane, but not all. Extreme high winds and torrential rains put unprepared structures at great risk of significant damage. Help prevent damage to your property by securing or reinforcing important areas of your home and grounds. Anchor bolts with heavy-gauge, square bolt washers can be installed during new home construction or added in existing structures to connect floor to foundation. For the best protection, install impact-resistant laminated windows or covered with impact-resistant permanent shutters that meet state building code approved standards. You can also install permanent fasteners so protective panels (such as plywood) can be quickly put in place. To offer adequate protection, plywood panels should be at least 3⁄4″ thick. This will help reduce the potential for damage or injury caused by flying debris and pressure changes during high winds. Entry doors of solid wood or hollow metal are more likely to resist wind pressure and flying debris. Consider installing high wind-resistant entry doors. All entry doors should have three hinges and a dead bolt lock with at least a one-inch bolt throw length. Door framing should be securely anchored to the wall structure using fasteners that are at least 3 inches long. If you have double-entry doors, secure the inactive door with head and foot bolts that extend through the door header and into the subfloor. Patio doors should be made of tempered glass. Shuttering doors offers extra protection. Consider installing a extreme wind-resistant garage door, or have a steel bracing kit installed to help support the door against wind pressure. You can also protect your garage door with a shutter or screen rated for wind pressure and debris impact. The garage door industry strongly recommends that any determination concerning the need to reinforce or replace a garage door be based on an inspection by a trained door systems technician or a qualified professional engineer. Adding weight to a garage door in the form of reinforcement may require an adjustment to or replacement of the door’s counterbalance system. Only a trained door systems technician should perform the adjustments or replacement. An inspection may find that other improvements should be made to an existing door, and if the door is old or damaged, replacement with a stronger door system may be recommended. Extreme-force winds can cause shingles to peel off, especially if edge shingles are not well-secured or the adhesive on their tabs has failed. A roofing professional can evaluate your roof, and, if needed, set additional roofing cement under each tab to help keep shingles attached during a high wind event. To help anchor the soffits to your home, apply a bead of polyurethane sealant between the wall and the trim into which the soffit panels are inserted. You can also apply a dollop of caulk in the V-shaped hole where the joint between two soffit panels meets the trim. Any cracks or holes where cables, pipes, or wires enter the home should be sealed with caulk. Move garbage cans, patio furniture, grills, and other potentially wind-borne objects inside your home or garage. Consider replacing gravel or rock landscaping materials with shredded bark. Store vehicles you plan to leave behind in a garage or other enclosure. Store boats securely. If your boat is ashore in a jack stand, strap the boat down when possible. If you have a pool, cover the pump filter. Anchor garage doors. Protect your family and coworkers from injury due to high winds and flying debris by constructing a safe room in your home and office. The basement is the best location for a safe room; otherwise locate them on the interior, ground floor. Safe rooms are constructed with reinforced floors, walls and ceilings and can be designed for both new and existing homes. For a reasonable cost, these rooms can provide you with peace of mind during a major wind event. While mobile homes can be attractive alternatives to traditional homes, they are also more vulnerable to damage from high winds as a result of non-permanent foundations. In addition, tie-downs could rust, weaken, wear out, or break, leaving the structure and your loved ones more susceptible to damage or injury. Tie-downs secure the frame, not the entire house. The home’s foundation-to-wall or wall-to-roof connections may be compromised in the wind. Failure in either of these areas could result in a complete loss of the structure. Remember, a community storm shelter or other secure structure is always a better alternative to protect from harm.